This week is Maker Faire New York City, and it holds a special place in my heart, for a number of reasons. A large part is because Maker Faire is where I started out, 3 years ago, with my humble little TouchShield Legacy and Arduino. At the time, I was traveling quite a bit for my day job, and barely had time to sit in one place long enough to do any serious development. Fast forward to the present - now I live in Boston, and after three years of driving or flying myself out to San Mateo for Maker Faire's, I'm pretty excited to have one in my own back yard... relatively speaking, that is. In the past, I've set up tables with some of my favorite hacks. 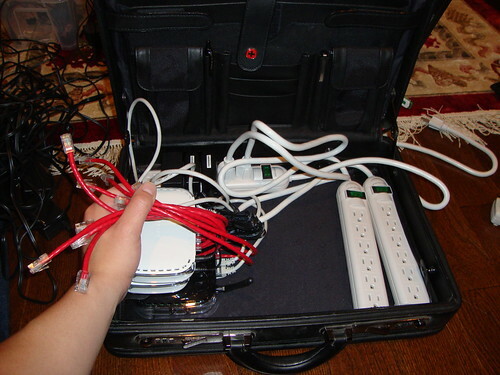 But this time, I'm going to be joined by Justin, Will, and Francis, fellow hackers at Liquidware. 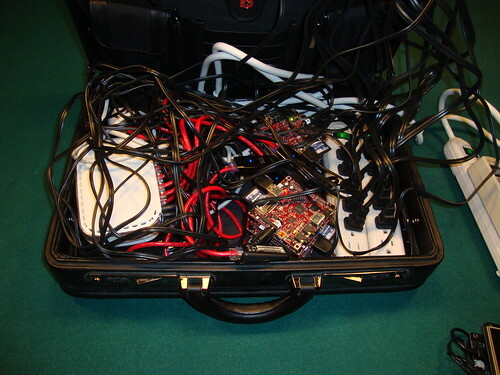 And instead of showing off only just my Open Source Hardware hacks, all 4 of us are going to bring along demos and hacks using the latest gadgets. To make things perfectly clear: I do not recommend emotional book burning. I think it's wrong and inefficient. I'm simply going to say this: If you're going to do "book burning" I believe you need to find a more modern way to achieve your goals. Use technology. Better yet, use Open Source technology to achieve your goals. Something about the press release events of the past week or so has rubbed me the wrong way. But not because of the reasons already expressed by the "media". It's because the guy in Florida is doing it all wrong. We live in a world with headlines filled with stories about Barnes and Noble and Borders books going bankrupt or being sold. Ebooks are taking over. Who can afford to think about burning books at a time like this? In order to have a serious book burning, there's a serious time investment. You'd first have to find the book you wanted to burn, order copies from 10 different retailers on Amazon, pick the most worthy copy, and then commence burning. You'd probably use some social media site to send out Evites or set up a Facebook event hoping people would pull themselves away from Farmville long enough to sit around watching a book burn. What a pain in the rear. If I think about some of my friends, I highly doubt that a book burning event would even hold their attention for more 30 seconds before they were checking their iPhones and Android phones, or sending email on their Blackberries. When is book burning ok? If I were homeless in the winter, in a cold climate, and had no other source of shelter, but had plenty of books and matches, I would hope people wouldn't judge me if I were to burn the books I had collected. Alternatively, if I were filming a movie about World War II, or a documentary about a time when books were burned, for historical accuracy, I hope people would appreciate that as art. I suppose if I were the author of the books, it's ok to burn them. This last reason is cause for serious suspicion. It supposes that there is a relationship between the intellectual property and creative process of writing, authorship, and acceptability of burning books. What happens when you burn books (or blogs)? No emotion. Some heat felt. Fire consumed 3 sheets of paper within 62 seconds, for a rate of 2.90 pages / minute. EMOTION!!! Some heat felt. Fire consumed 4 pages within 1:48 at a rate of 2.22 pages / minute. The pages were printed with 1622 words across 189 lines, or 7750 characters. Another way to say this is, my book burning experiment consumed 143.5 bytes / second. I'm going to assume that the way I folded the paper to allow oxygen in had more to do with the rate of burn than factors like wind (there wasn't any), flammability or not of the ink, or perhaps because my writing is so bad, it burns faster because thermodynamic principles are trying to undo the entropy I create. 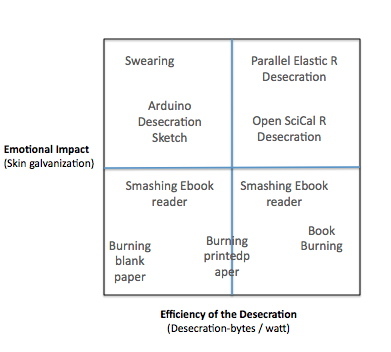 Thought Experiment: Why do people burn books? -Heat. Not great support for burning books. Modern heaters are known to be more efficient. Plus burning books isn't the quickest, easiest way to generate heat. -Light. Also not great support for burning books. LED lights are a much more efficient way to achieve this. -Waste. So so. Just throw it in a landfill, or plant it at the base of a tree to fertilize it. Burning many books, however, may save the time and energy to lug them all to a landfill, so it's a toss-up here for me. -Publicity leading to social unity. Probably a toss up. This is a lot of effort, and you likely have to create significant consternation before you'll get noticed in the mainstream press. -Desecration. Now this, I think, is the important point. Steve Jobs would probably burn the second volume of my book. Because it's all about Open Source Hardware Strategy and Economics, like what Google uses. Steve hates Open Source, Google, and things that are Open Source like Android, so it's understandable that he might seek to desecrate ideas associated with them. But here's the problem: if you're going for desecrations, why settle for mediocrity? Why not go all out and desecrate in a modern, digital way? Running this sketch achieves 30,000 digital desecrations within roughly 800 milliseconds. This is an effective desecration rate of 1,440,000 desecration-bytes / second! It instantiates an array with a phrase, filled with digital bytes of information, and then deletes it from memory. But it does so in the most desecratory way you could imagine: 1 helpless, bloody char at a time - and not even with civil memory management!? From a programmer's point of view, this is heresay. This is like torturing a person by pulling his fingernails out one by one, like every one of those Saw movies. It's like tearing out the pages of a book one by one, and then burning it. Couldn't you have just dereferenced the array pointer, and left the char array in memory? Or if you have to move on, why not just call memory purge? Seriously?!?!! Is that middle step really necessary? If you're going to delete something just throw it out. There's no need to iteratively replace bytes in memory - without even a simple purge. That's unnecessary and ridiculous. To me, book burning just doesn't have the same impact as it did when the scholars looked on as the Library of Alexandria was burned to the ground. But this R code hurts. And it's going above and beyond the call to destroy. One could argue that you could measure the strict word count (which is like page count). You could measure file size in bytes, but that's a proxy for document length. You could measure unique words. You could even measure Shannon complexity of the document. I think there's an open question, perhaps requiring further research, to examine whether or not it makes sense to count bytes, characters, words, or perhaps on synonyms of a specific trigger word or phrase that is considered "desecratory". Perhaps there is an ontological argument to be made about the distribution of desecratory-capable phrases in a document (does it follow a long tail?). I would argue you want to measure the entropy of the desecrations, which I will define as: number of RAM instantiations and removals of bytes associated with the topic to be desecrated. Here's some Arduino code that runs on the Arduino and blinks a red LED every time a desecration takes place. 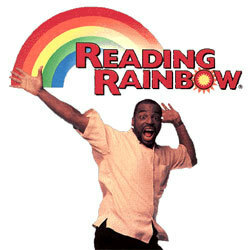 I believe book burning is about the public destruction of intellectual property. In a world over-run with new forms of media, and open source software and hardware, however, we need to catch up with the times. I applaud people for having strong beliefs, but if you're going to desecrate someone's intellectual property or creative works, then do so with a modern toolkit! 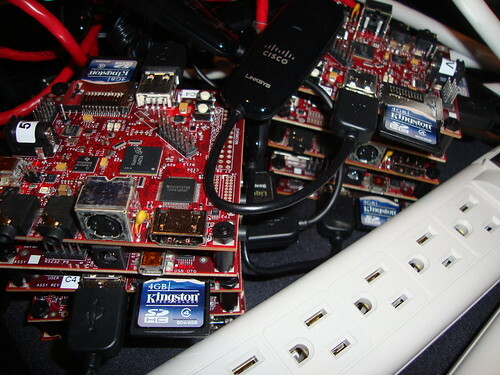 And do it with Open Source Hardware, why don't you, so others can share in your destructive acts! With the relaunch of the Illuminato Genesis (which was featured on Make Blog a while back), I figured I'd whip together an app that showed off the what the Illuminato Genesis can do. 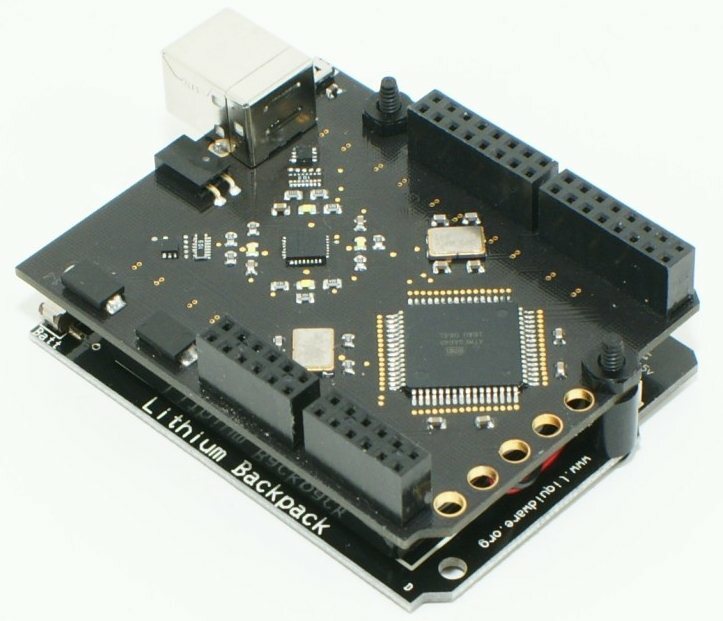 I've been spending a lot of time with the BeagleBoard recently, and that's clearly a top end type device, but the Arduino and Illuminato Genesis plus TouchShield Slide make a nice gadget at the lower end of the spectrum, especially for smaller handheld apps. The Illuminato Genesis has an array of gold-rimmed LEDs on the backside of the board, which can be called using a function in the Antipasto Arduino IDE library called bling(). bling(1) turns the LEDs on, and bling(0) turns them off. Then, using serial communications between the Illuminato Genesis and the TouchShield Slide, the PWM'ing is synchronized so that both boards are pulsing at the same speed. The effect is pretty cool looking, if you ask me. On the one hand, you have real LED's on the back of the Illuminato pulsing, and then you have virtual LED's on the TouchShield Slide's OLED pulsing. But if he had 42 I/O pins, and had twice the memory, he could function like he's me. Where are you? Your in a lab with wires. With the Arduino your Arduino could look like. It's an oyster (or 2 shells) with two USB mini B connector cables to interface that thing you love. The cables are now a TouchShield Slide! Anything is possible when your Arduino is an Illuminato Genesis and not a Duemilanove. 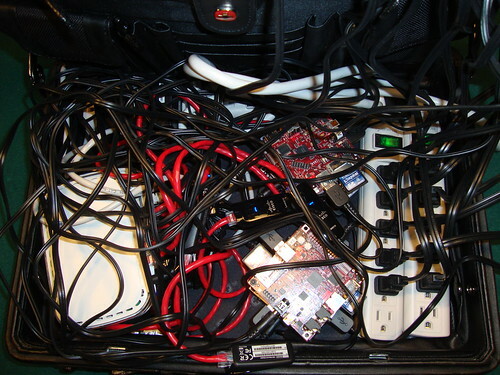 The emergence of "instant prototyping" vs. "rapid prototyping"
A couple days ago, I talked about why I liked using and programming modular Linux gadgets. Mike wrote me a long email in response to my comment about "rapid prototyping" vs. "instant prototyping" which I thought I'd share. With the growing popularity of MakerBot, the reduced transaction costs of interfacing with sensors and digital circuits that the Arduino allows, and the emergence of modular prototyping platforms like Liquidware's Beagleboard-based gadget packs and Bug Labs, it feels like there's been a fairly dramatic increase in single-programmer productivity. 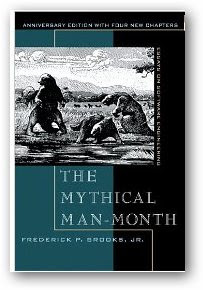 I re-read one of my favorite books of all time, "The Mythical Man Month" by Frederick Brooks. Normally I don't get too excited about dense, heavy, cerebral books that don't have any practical advice unless they teach a new programming language (or algorithm). But in this case, I make an exception, because it's just a decent book that questions the process of engineering. At some point, for the sake of humanity, I just hope someone remembers how to actually do something tangible! But I digress. Turns out, I enjoyed the book. It got me thinking. The Matrix movie got me thinking, as did the movie Inception (actually the 13th Floor did too but fewer people saw that one). So the fact that a book held such high company in my mind as the Matrix, Inception, and 13th Floor is high praise coming from me. 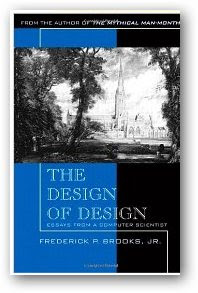 Much of the book was focused on the process of designing design processes. How many designers are too many, how should they work together, how do you organize to solve problems? I had a thought while reading the book: design exists because planning for engineering is an important and valuable step in communication and preparing to optimize problems. This is largely because engineering takes time. Engineering, or building, or solving problems takes time. But what happens if you break into a new plateau of productivity? What if that time is reduced significantly? I've hit a personal plateau and breakthrough in productivity twice. Once in software, once in hardware. The software one happened a few years ago, and the hardware one happened about 2 weeks ago. 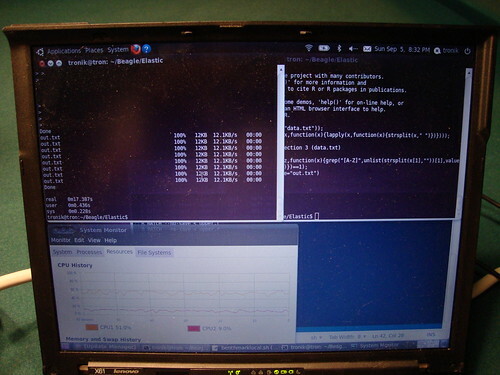 My personal software productivity came when I moved from C programming to purely Perl. I realized that I could write an algorithm faster in Perl, and make a functional program faster, than I could in C. Because of that, I could iterate on the program faster, add new features, in less time. The next bump came when I moved from Perl to R. I could do almost everything I could in C in R, except that R also let me access tons of higher level math building blocks. I became really fast at writing code in R... although it took the code longer to execute, I focused on optimizing the algorithm or the way I wrote a function, as opposed to spending lots of time debugging Perl data structures, or C memory leaks. The common thread was that R allowed a higher level of functional modularity, but still exposed the lower level functions and data types for me to use when I needed them. 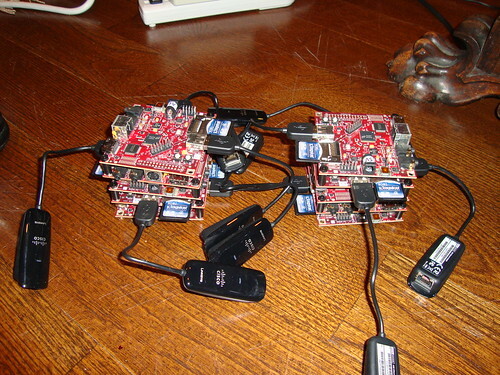 Recently, I've felt similarly faster at building hardware than I used to be. I used to have to write PIC chips into protoboards manually with wires that I stripped and cut myself. Then I got excited about Basic STAMP boards because they let me focus more on the code, and on a few simple digital IO pins. 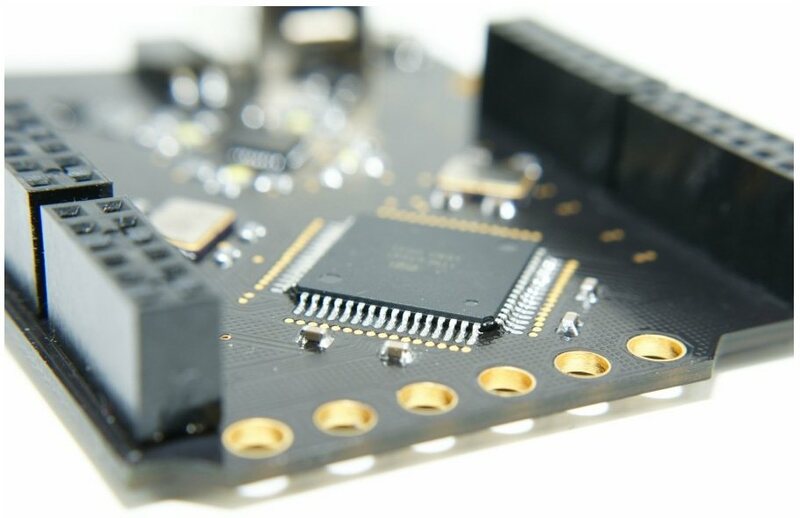 Then the Arduino completely changed the way I thought about accessing sensors, switches, and digital interfaces in general - it significantly lowered the "hardware access barrier" if such a thing exists. In practical words, it let me sit down, and hack the E-Ink screen on the Esquire magazine cover in a matter of hours, rather than days. 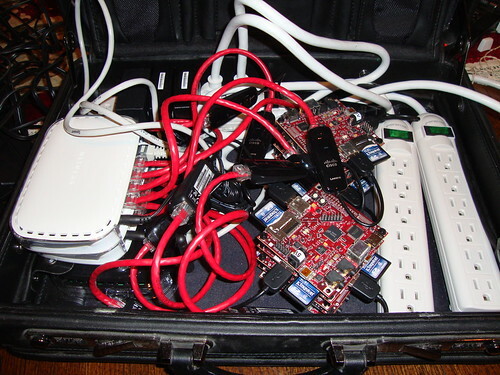 Now, I'm hacking away on Arduino gadget shields and BeagleBoard Gadget Packs... and the time it takes to go from "I have an idea for a gadget hardware that does XYZ" to actually having one in front of me is measured in minutes. I think I've found the critical pattern... just like in software, the biggest productivity improvement came as the hardware allows a higher level of functional modularity. 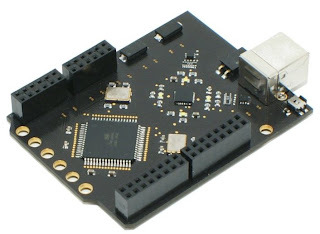 I'm interfacing with sensors now, as opposed to I2C buses, so I'm able to build a hardware device even faster using a new sensor, for instance. 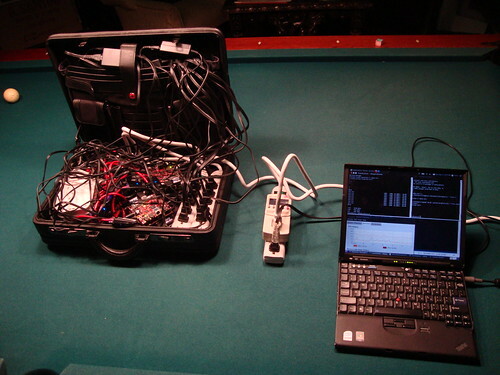 But the important part is that as the hardware gets higher and higher level, it still gives me access to the basic bit-banging serial and data IO ports and buses, just in case. That's the biggest difference in my design philosophy and that of Apple. While Apple *hides* digital IO and obscures interfaces, everything I've ever built *opens* the digital raw interface, and keeps that exposed and really easy to access from Perl, R, and C, even as the modules higher level. 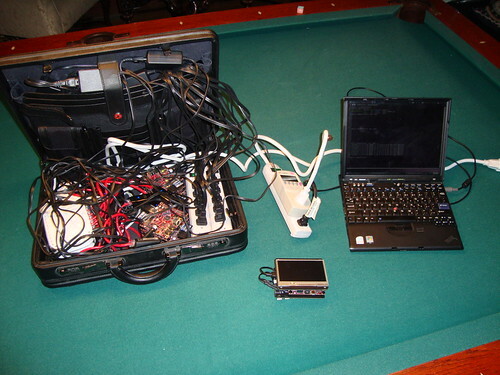 The result is much faster hardware and software development. As this continues, the time it takes to prototype decreases. At some point, the time it takes me to prototype a device might reach the time it actually takes for me to just build it anyway. 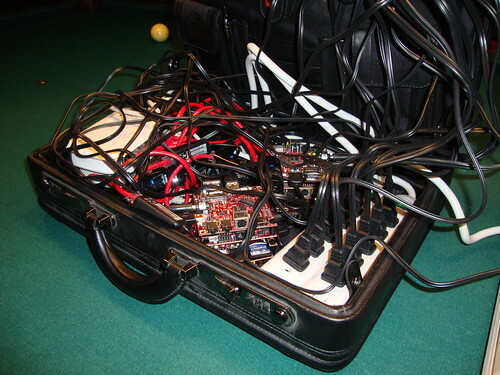 And maybe that's some new concept or field of "extreme" or "agile" instant hardware prototyping. Why? Because Open Source Hardware is about lowering design barriers, exposing underlying schematics functional blocks, and the result is that prototyping with Open Source Hardware - in my experience - is orders of magnitude faster than traditional dev kits, and proprietary hardware.